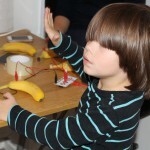 Here are some selected pictures showing our younger jammers during the SETI game jam. During the two days that the SETI jam continued, we collaborated with Spelverkstaden to provide two 4-hour mini jams for kids 8-12 years old. A total of 13 kids took part in the mini jam, which resulted in 10+ game prototypes built with Scratch and MaKey MaKey physical controls. Get ready to sign up for GGJSthlm 2015!